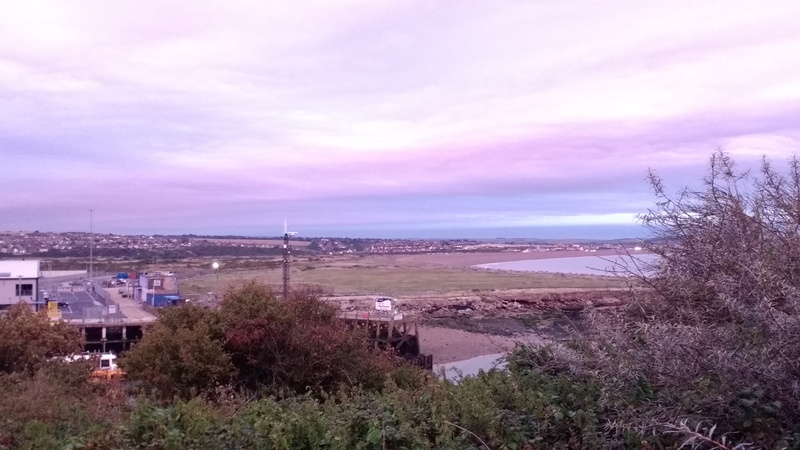 East Sussex County Council has approved the development and issued planning permission for a new concrete plant at Newhaven East Quay. Plans for the Brett Newhaven concrete plant, marine-dredged aggregates importation wharf and bagging facility was approved at a planning committee on 25th July 2018, and planning permission granted on 15th August 2018. The new concrete plant and Brett aggregates facility will see products transported via road and rail, making use of the recently redeveloped Newhaven Marine Sidings. Redevelopment of a berthing area in Newhaven Port will enable ships to unload aggregates at the Brett aggregates and concrete plant which will be turned into building materials. The land to be used for the plant resides beside the new Rampion Off Shore wind farm servicing facility. The screenshot shows the Newhaven East Quay area. Top left shows the Newhaven Marine railway sidings curving in to the proposed area of the Newhaven Brett Aggregates concrete plant, to be built just south of the “Newhaven Port Authority” pinpoint. Screenshot from Google Maps. Despite many protests by locals campaigning against the development of the plant, the project was only narrowly approved. The new plant will see many new jobs created in Newhaven and will have a positive effect on the local economy. It is yet to be decided which train operating company will get the contract to work trains to and from Newhaven Brett Aggregates. Sure is, looking forward to the new freight traffic flow out of Newhaven.